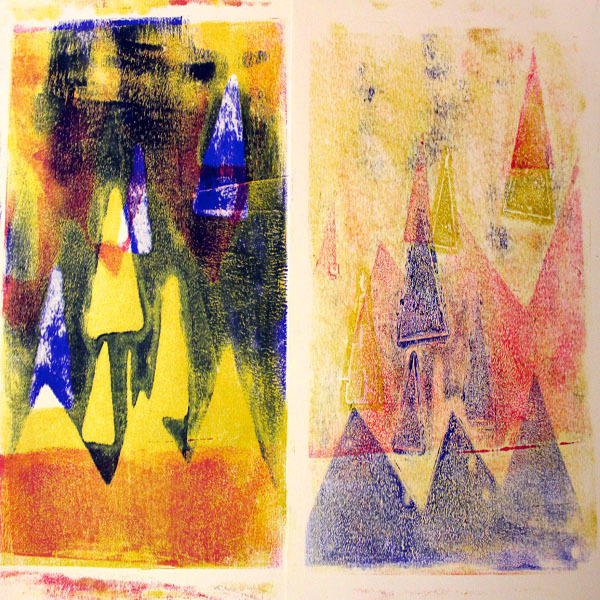 Project Description: The second in our printmaking series, will be creating a Reductive Monoprint using masks. A reductive monoprint is created by adding paint to one surface, then removing areas of paint via wiping, masks, or stamping materials. The design is then transferred to a second surface to create an original print. Note: Monoprints are exciting because the results are often unexpected, and you’ll never end up with the exact same print twice. You can frame the whole print, or try cutting it up to create a collection of prints. Make sure to cover your work area, as monoprints can be messy. Add a dab of paint to the plate, then smooth out evenly with the brayer. Add your mask shapes. Remember, the areas you place the shapes will be free of paint on your print. 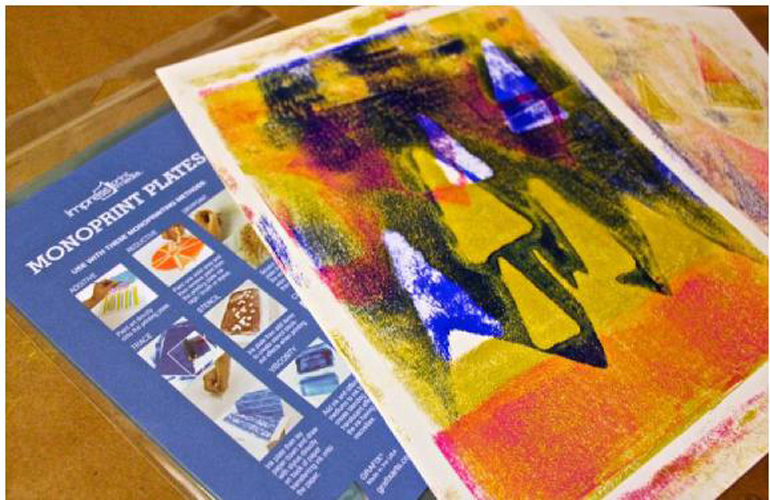 Place the paper face-down on the plate and rub firmly with your hand or a clean brayer. Carefully lift the paper. You can take a second print, called a ghost print, with the remaining paint. Remove the masks and press a new sheet of paper on the plate. Rub and then lift the paper. Wash the plate, then roll on a new color. Repeat the process of adding shapes, pressing the paper, and pulling the print. Add as many layers as you like. Let’s try a new design. For this one, I’m going to create some letter masks. I love that I can cut these out of Cling Vinyl, and reuse my alphabets indefinitely. The important thing to remember is that your design will appear backwards on your print. Therefore, you’ll need to place the letters backwards, with the first letter on the right hand side rather than the left. 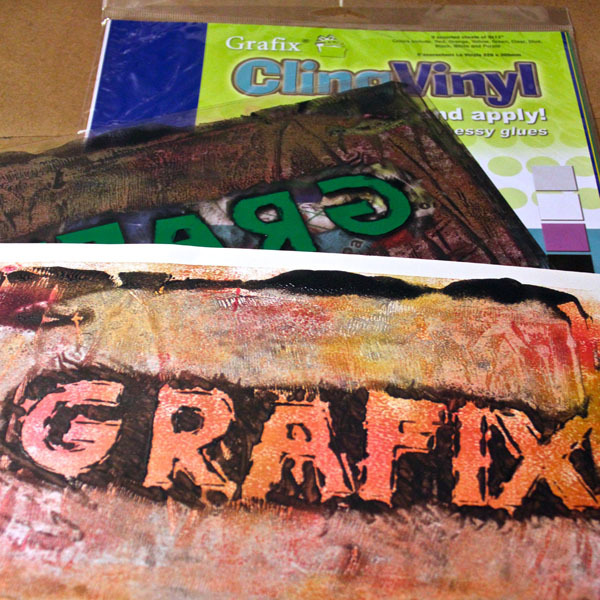 Luckily, Cling Vinyl is two-sided so it’s no problem to reverse the design. 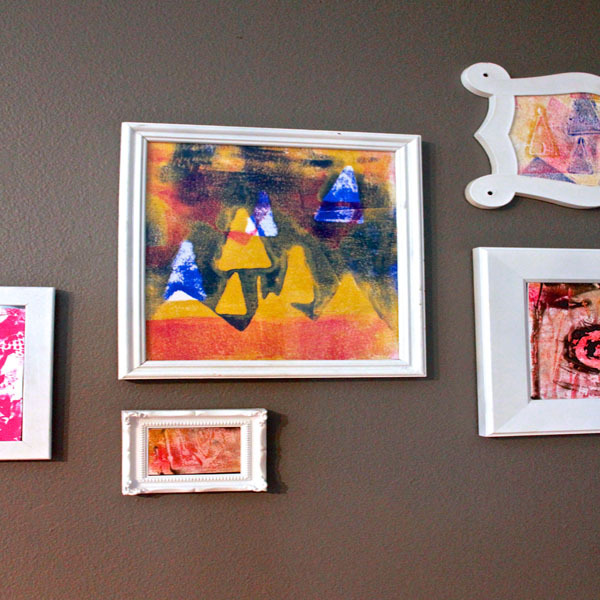 You can also add interest to your prints by removing paint with stamps or textured items. Try using plastic canvas, yarn, or bubble wrap. For Print Making Series Part 1 click here.